Hello everyone, and welcome to the Open Forum, which is hosted by Kotaku's reader-run blog, TAY. This is a place to talk about life, video games, or anything else, so feel free to hop in and join in the topic discussion, or comment about anything. Then, when you're done, feel free to peruse the articles on TAY and TAYClassic. Is this your first time on TAY or the Open Forum? Then check out this handy TAYTorial! It's Friday the 13th, which is a day I always loved because it was my favorite day and number. Bad luck is only bad luck if you believe it. On to the topic! 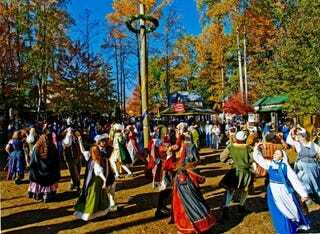 See that beautiful picture up there...that's the Maryland Renaissance Festival, where I will be this weekend. I'm looking forward to Macaroni and Cheese on a Stick, because at Renn Fest everything is on a stick...and deep fried. (I'll take pictures. You'll see.) So have any of you been to a Renn Fest? Do you dress up? Do you have any traditions? Anything you buy/eat/horde each year? If you don't want to talk about this, feel free to talk about anything! Flashback Friday Funtimes (? ): Family Woes!